Dancing into week 3 with Bobby Wabalanginy. 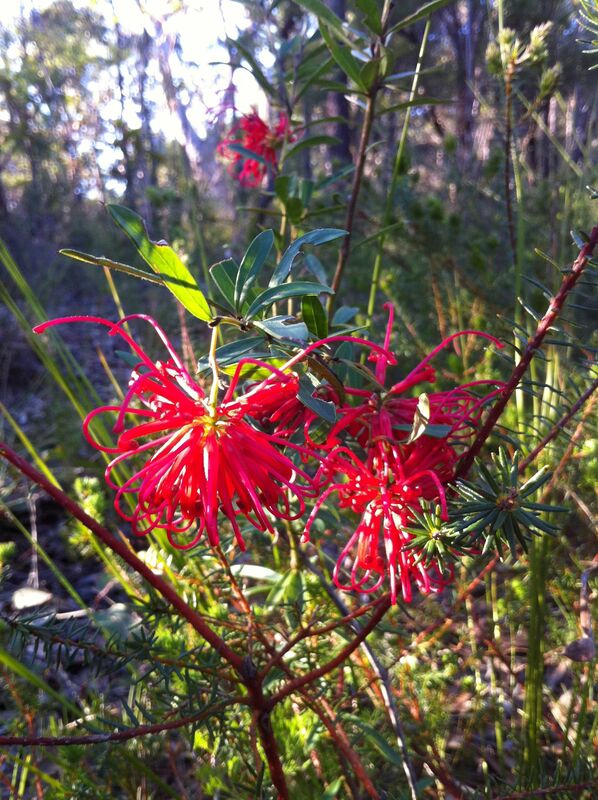 Red Spider Flower (Grevillea Punicea) taken on my bush walk in Galston Gorge this Saturday. For more see Photos. In Australian Literature we have been spending the last two weeks exploring this year’s Miles Franklin Award Winner That Deadman Dance by Kim Scott who has a white mother and an Aboriginal father of Noongar descent. This novel brings refreshing and hopeful perspectives to the experience of black and white Australians and tells an awe inspiring story of the earliest contact between the Noongar people, the British settlers and the Yankee whalers. The great strength of this novel is the way it uses language powerfully to weave together the contrasting experiences of early settlers who have limited ways of relating to the land and the experiences of the Noongar whose relationship is deep and imaginatively rich. The book celebrates the indigenous perception of the world and helps us with white vision to understand what we are missing in our lives. It is a book that every Australian should read in this post-reconciliation phase of our relationship with the true owners of this country. Bobby Wabalanginy is the indigenous narrator of the story; he is himself a story-teller, a singer and an entertainer. He is Kim Scott’s alter ego who brings this wonderful narrative to life in all its rich diversity. In the Twentieth Century we have been exploring the theme of war and in particular the ways in which so many young creative minds (Wilfred Owen, Siegfried Sassoon and others) afflicted by the madness of the trenches were able to write such devastatingly subversive and accurate accounts of the horrors inflicted upon them. The real villains behind this horror were those administrations (in England, Germany and America) determined to impose their power on the rest of the world. All great literature deeply questions the status quo and just as Kim Scott makes white Australians feel shame for their mistreatment of the rich civilization that is Aboriginal Australia, so the war poets could still make politicians world-wide ashamed of their commitment to war as a way of solving global problems. For those wishing to experiment with blogging in Australian Literature you will find your topics here. For those doing blogging in Twentieth Century Lit find topics here and for Visionary Imagination here. Enjoy. Remember to edit your work carefully before posting. Check out my latest bush-walking pictures if you want to be educated in Australian plants: my passion and joy!